Those who know Guna, know he’s a special human being, genuine and authentic. He brings both light and lightness to the world and his love of life shines through most in his music. He sings, writes, composes, plays and produces sweet music for the soul. Next to arranging and producing, he is also in charge of the sound engineering at the Magicland Studio. For seven years he left Germany to reside in the United States, Central America and Canada, and for more than three decades he’s performed his music in the USA, Canada, Mexico, Guatemala, Trinidad/Tobago, Venezuela and across Europe. 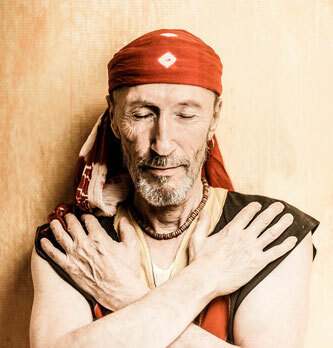 He’s played World Music with various national and international musicians but it wasn't until having been a steady member of the Janin Devi - Tour 2013, playing live in Germany, Switzerland and Holland, that he started loving Kirtan and Bhajans. 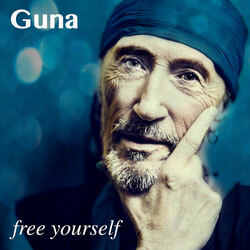 Guna (also known as Nada Das) stands and sings for freedom, peace, oneness and harmony. "I have travelled many countries and my music is strongly influenced by these different cultures. I love to mingle styles and instruments. I've got that strong urge within myself to play music everyday - and I do so. It comes right from the bottom of my heart. It's like a routine, that helps me stay calm and centered. To be connected with the source of it all is really important to me. That way I feel, I get played - by the great cosmic master musician." The uplifting music of the charismatic singer stands for mutual tolerance, for trust and faith beyond borders, for cultural co-operation and a profound exuberant love of life. Guna had been involved in Raja Yoga / Surat Shabda Yoga and Meditation in the early seventies and never stopped longing for realisation, love and light ever since. His daily routine of Bhakti Yoga makes everybody around him radiate happiness. The anti-war song "Necesitamos la transformacion" , more songs from the album "free yourself", published in 2013, and songs from his new album "Shine" published in 2016 have recently gotten airplay on KUBU 96.5 FM in California, USA.